On the evenings of July 10 through 12, the annual Chautauqua Summer Series brings three live performances to the Chesapeake Bay Maritime Museum’s (CBMM) waterfront. This year’s Maryland Humanities’ series features Voices of the Great War, with all living history performances taking place from 7 to 9 p.m. along Fogg’s Cove and the Miles River. All performances are free and open to the public. Maryland Humanities’ 23rd annual Chautauqua Summer Series, Voices from the Great War is coming to the waterfront Chesapeake Bay Maritime Museum in July. This year’s theme features living history performances of W.E.B. 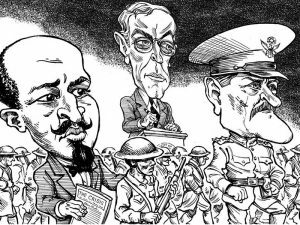 Du Bois, General John Pershing and President Woodrow Wilson, as illustrated by Tom Chalkley. The 2017 Chautauqua Summer Series at CBMM is generously sponsored by Karen and Langley Shook, and is funded in part by a grant from the Talbot County Arts Council, with revenues provided by the Maryland State Arts Council, Talbot County and the Towns of Easton, Oxford and St Michaels. “The world must be made safe for democracy. Its peace must be planted upon the tested foundations of political liberty.” With these words, President Woodrow Wilson asked the United States Congress to declare war on Germany. For nearly three years, war raged in Europe after the 1914 assassination of Archduke Franz Ferdinand of Austria sparked a diplomatic crisis. Despite attempts to remain neutral, because of various acts of aggression by Germany, including the death of 128 Americans in the German attack on the British passenger liner RMS Lusitania, the United States officially entered World War I in April 1917. For its 23rd season, Chautauqua is commemorating the 100th anniversary of the United States’ entry into the Great War as three World War I-era figures come to life. On Monday, July 10, Bill Grimmette, a living history interpreter, storyteller, actor and motivational speaker, will portray W.E.B. Du Bois, a sociologist and scholar, and one of the most important African-American activists of the early twentieth century. On Tuesday, July 11, Chautauqua veteran Doug Mishler, an independent scholar who has taught at the University of Nevada and Western Washington University, will portray General John Pershing, commander of the American Expeditionary Force on the Western Front in World War I, who was one of America’s most accomplished generals. On Wednesday, July 12, the St. Michaels series wraps up with Judd Bankert bringing to life President Woodrow Wilson. Judd has been portraying President Wilson as part of the Woodrow Wilson Presidential Library and Birthplace’s living-history program since 2000. A Chautauqua performance is a historical dramatization featuring individuals who are part scholar and part actor. Each performance is broken into three acts, where the performer represents a historical figure in the first person, then invites audience questions; and in the final act, steps out of character to answer questions that the historical figure could not have been able to answer. “Chautauqua” was the name for the Chautauqua Lake area in upstate New York where the movement began in 1874 as a Methodist summer retreat. A wide range of religious lectures and educational programs attracted a huge following. As it evolved, the Chautauqua movement presented the latest in thinking in politics, economics, literature, science and religion. Maryland Humanities launched the modern Chautauqua program in Maryland in 1995. The Chautauqua Summer Series at CBMM invites guests to bring carry-on food and beverages along with their own chairs and blankets for seating. All performances are held on the lawn of Fogg’s Landing, near CBMM’s Steamboat Building, with convenient entry adjacent to parking. In the event of rain, performances will be held in the Van Lennep Auditorium, with space limited. No registration is required. For more information, visit cbmm.org or call 410-745-2916. Additional information about the Chautauqua Summer Series can be found at mdhumanities.org.